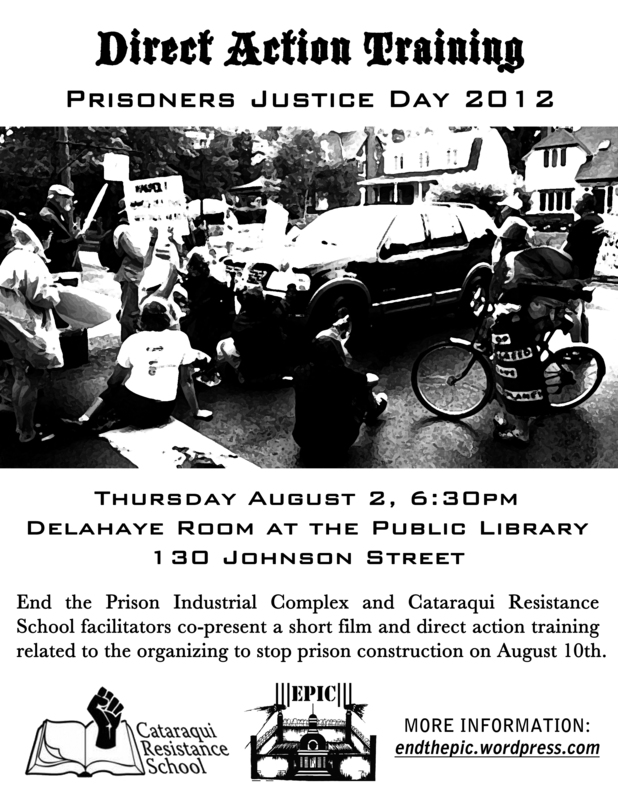 AUGUST 10th: ALL OUT FOR PRISONERS JUSTICE DAY! August 10th is Prisoners’ Justice Day, a day in remembrance of all of those who have died at the hands of the prison system. Prisoners fast and refuse work on this day, while outside the walls organizations and individuals demonstrate in solidarity. We want a world without prisons, and will resist their expansion any day of the year, but it would be especially offensive to see cranes, trucks, and workers expanding the prison on August 10th while prisoners are on strike inside. We invite you to join us early in the morning on August 10th to shut down construction at Collins Bay Penitentiary in honour of Prisoners’ Justice Day. This will also mark the two-year anniversary of the Prison Farms blockade at the same location, a historic mobilization for Kingston. Keep your eye on https://endthepic.wordpress.com/pjd for updates. 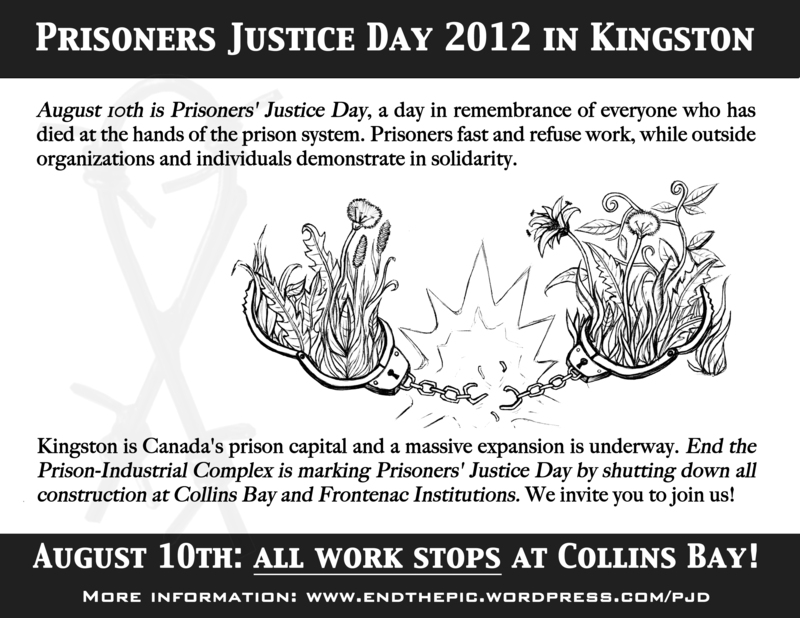 This August 10th, join us in Kingston to mark #pjd2012. Please circulate widely – see you August 10th! ATTN: Local EPIC Friends and Allies! We need places for out-of-towners to stay during Prisoners Justice Day events in Kingston, August 9-10. If you have space, please let us know ASAP at epic [at] riseup [dot] net with “Offering Billets” in the subject line. Hosting folks in your house for a night or two is an excellent way to meet new activists and new friends, and expand your personal and political networks. We anticipate activists from all over southern Ontario and parts of Quebec needing places to lay their heads. Spare rooms are grand, but so are couches or spots where folks can unroll a sleeping bag. Please consider letting someone share the roof and/or your backyard (for camping) during Prisoners Justice Day events in Kingston! If you have any reason to believe that your house contains bed bugs, please be upfront either with us or with your billeters. If you can lend general support (such as providing childcare or offering transporation) to this action, but for whatever reason cannot participate directly, let us know! Please also inform us of anything you think we’d need to know in order to appropriately match you with a place to stay. Do you need childcare on August 10th? Do you have any allergies you want us to consider? Are you comfortable staying alone, or are you traveling with someone that you absolutely must stay with? Etc. We cannot guarantee space, but we will do our absolute best to help everyone find places that meet their specific needs. If you have any reason to believe that you may travel with bed bugs, please be upfront either with us or with your homestay. Feel free to print and distribute our flyer below! End the Prison Industrial Complex and Cataraqui Resistance School facilitators co-present a short film and direct action training related to the organizing to stop construction on Prisoners Justice Day, August 10th. The information will cover topics ranging from legal rights to tactical effectiveness. A letter to construction workers at Collins Bay and Frontenac Institutions. End the Prison Industrial Complex (EPIC) is a Kingston-based prison abolition group. We have been organizing resistance to prison expansion for the past two years. August 10th is internationally known as Prisoners’ Justice Day, which started in 1975 at Millhaven to commemorate those who have died at the hands of the prison system. Out of respect for this day of mourning, prisoners inside refuse work and food. This year, we intend to shut down all construction work on the grounds of Collins Bay and Frontenac Institutions in solidarity with prisoners on strike inside. We are writing to ask you to stay home from work on Friday, August 10th or – better yet – join us on the lines. Our goal is not to antagonize construction workers who are trying to make a living and have little or no say over which jobs to work; instead, our goal is to demonstrate our solidarity with prisoners inside, and pay respect to those who have died. We believe a world without prisons would be better for everyone. Why Not Work on Prisoners’ Justice Day? Prisons and prison expansion affect us all. Under the guise of global economic crisis, we see governments responding with austerity, “tough on crime” measures and increased repression of dissent. As more people lose hope in a decent future under this current system, crime will increase and more people – particularly those most marginalized by the system – will be put in jail. Prisoners are exploited by government and corporations as cheap labour. They will go on strike August 10. A major practical aspect of solidarity means not crossing a picket line; we consider crossing lines on August 10 to be scabbing. We know some workers at this site have four nine-hour shifts, Monday-Thursday. If this is the case for you, working Friday is entirely optional and you cannot be punished for not working. Trying to cross a hard picket with a vehicle is unsafe for everyone. It could injure protesters or provoke unpredictable confrontations. Police also tend to escalate tensions if they choose to intervene, which can become dangerous. You have the right to refuse unsafe work under the Occupational Health and Safety Act. If you are in a position to do so, speak with your co-workers about collectively refusing to work on Friday, August 10. There is strength in numbers and solidarity. Whether you refuse to work because it’s voluntary, unsafe, or you’re feeling sick, find a way not to come in. If you are in a union, seek support from your steward and/or local. Pass a resolution at your next local meeting supporting Prisoners’ Justice Day and/or workers who refuse to work August 10. If you can’t see a way to get out of working at Collins Bay August 10, email us at epic [at] riseup [dot] net and we will do whatever we can to help. Join us on the lines! It will be a fun-filled day where we can extend meaningful solidarity to prisoners on strike and build our local capacity for resistance! Stay tuned for more information at http://www.endthepic.wordpress.com/pjd, follow the hashtag #pdj2012, and/or join our announcements listserv. Why are we stopping construction on the halfway house being built to assist prisoners? 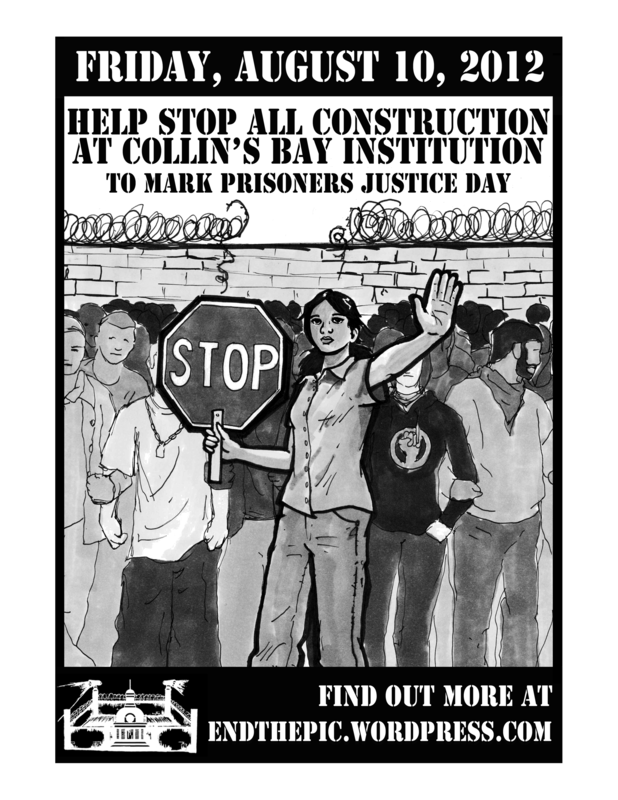 We have been targeting the construction of new prison units (such as CBB11 at Collins Bay), but will be stopping all construction at Collins Bay to show respect for and solidarity with prisoners on strike for PJD. Also, this CSC halfway house is being built to replace the Portsmouth Community Correctional Centre, which was located in Portsmouth and shut down in the interest of “public safety.” So this new CSC “halfway” (tenth-way) house will be located inside the penitentiary, making it hard to distinguish from a minimum-security prison. CSC doesn’t exist to assist prisoners, but to manage the imprisonment, regulation, and surveillance of them as an arm of the state and its interests.